A Powerful, Affordable Handheld Laser Particle Counter for Quick Detection of Particles that Could be Mold, Dust, Pollen, & Other Airborne Indoor Air Pollutants as Small as 0.5 Micron for Accurate Home & Industrial Air Testing. Most people looking for a way to be certain that indoor particle levels are low enough not to affect health, allergies, or activities requiring low to zero particle counts begin searching for a laser particle counter—and soon find that most air monitors are either very expensive, hard to use, bulky, and not very portable. Fortunately, Dylos Corporation has found a way to make highly-accurate portable indoor air monitors that are affordable for just about everyone, without sacrificing performance or quality. The Dylos DC 1100 Pro Air Monitor with PC interface gives you all the features of much more expensive and complicated laser particle counters, all in an easy-to-use portable unit that will evaluate the air in a room and give you an accurate reading in just a few seconds. The Dylos DC 1100 Pro air monitor detects and counts particles (bacteria, mold, pollen and many others) down to 0.5 microns, which is sufficient for about 95% of particle-counting situations. 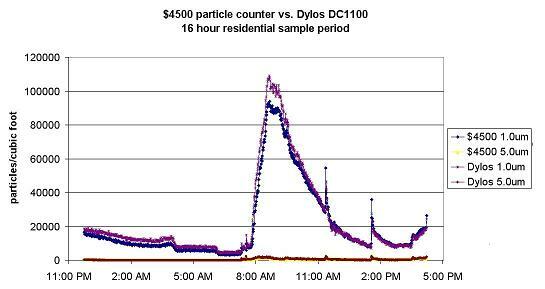 The DC1100 Pro will show accurate particle counts by minute, hour, day, and store up to 30 days of particle counts for easy comparison---to see if what you're doing is working, or if an air quality situation is improving or not. The amazing Dylos DC 1100 Pro air monitor can tell you in a matter of seconds if any type of air filtration system or unit is doing its job--or not, whether filters need to be changed, where they need to placed, and much more. For anyone that needs to always be sure of how many particles are floating around in the air in any enclosed or outdoor space, the Dylos DC 1100 Pro with PC Interface makes it very easy and affordable. Order your Dylos DC 1100 Pro with PC Interface and get the results you want—every time! 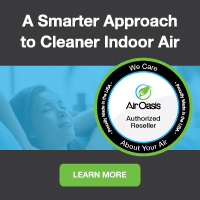 Perfect for any space where air quality and safety is a concern. Severe Allergy Sufferers--place this unit outside a window or in a window sill to see what the air conditions are outside BEFORE going out! Excellent tool for contractors, shop owners, etc -- you can test the air for your clients and your employees to ensure their safety! Important tool for testing air quality and SAFETY in areas recently subjected to FLOODING, weather damage, or other particle contamination. Insurance Adjusters--determine conditions present and display / transmit key data for claims situations. Great for use in the home to continuously monitor air quality for you and your family--if there are any new particles floating around--you'll know about it! 90 Day Limited Warranty from date of purchase against defects in material or workmanship. Non-PC order ships within 24-48 hours. PC Interface orders ship in 2-3 days. The DC1100 PRO PC Air Monitor has multiple modes including minute, hour, day and monitor to evaluate your air quality in a way the best suits your situation, and store up to 30 days of air quality history for review / evaluation. May help you determine the day / time when a particular air quality threat was presented and possible causes / solutions--information that is sometimes very useful in legal cases! "…my first impression is good. It seems to be accurate. Very easy to use (plug it in and turn it on), you can’t go wrong for the price. Neat!" 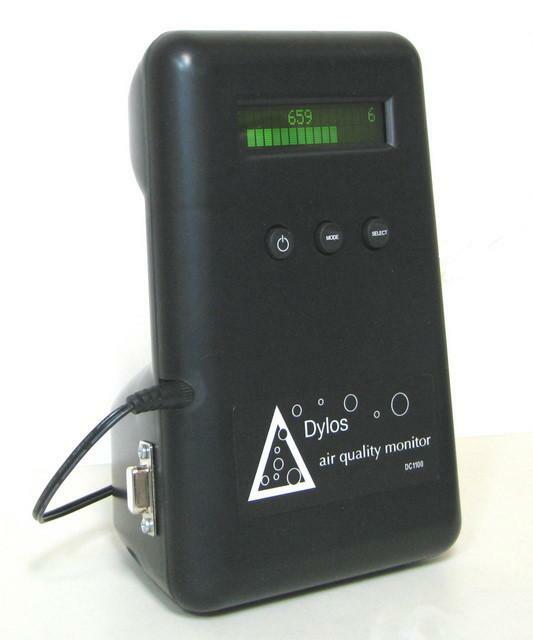 "..the Dylos air quality monitor proved to be an effective and economical tool for diagnosing my bronchitis/asthma problems. I suspected, with my doctors help, the air quality in the house was part of the problem with my constant coughing and labored breathing. The monitor analyzed my home air quality and by comparing the LCD screen readings with the chart on the back I found the particle count was in the "very poor" range. I installed a high efficiency electronic air cleaner on my furnace and within a day the Dylos monitor indicated the air quality had gone from very poor to excellent. To my surprise my bronchitis/asthma cleared up in three days. No more steroids, antibiotics, inhalers and cough suppressants!